Traditional style detached villa set on a double plot within the desireable urbanization of “El Alcazar”. Situated on a quiet location at a cul-de-sac and with easy access. 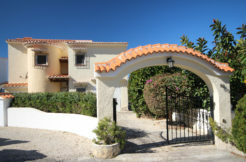 The villa has the main accommodation on the top floor, offering a spacious living room with fireplace, open kitchen, bedroom, bathroom and a television room that could be a second bedroom. The lower level offers two guest bedrooms, each with bathroom, and a store room. It has a separate garage with store room underneath, double carport, a 12×5 pool, shower, terraces, garden with irrigation system, petanque and ample parking space. The property benefits of gas central heating and has south-west orientation.